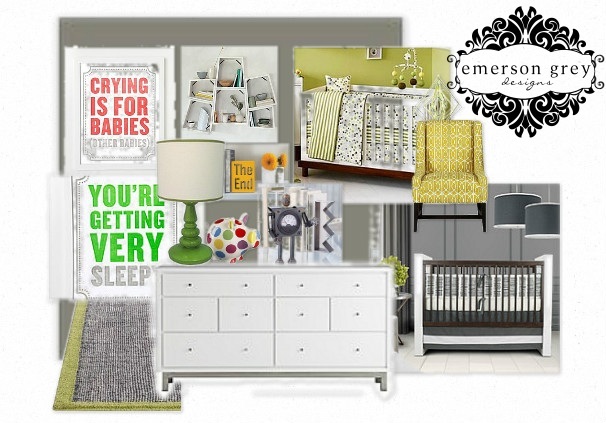 Here is another design board for a room I did recently. The expecting mommy was so fun to work with! She is super creative herself, so it was more of a job where I provided guidance and helped with the final decision making. The main color scheme of grey and green was our jumping off point and then we incorporated pops of mustard yellow. A great rocker turned into the best feature piece, which we had covered in an amazing Dwell fabric. This is just a sneak peak. Lifestyle photos coming really soon! Get excited!